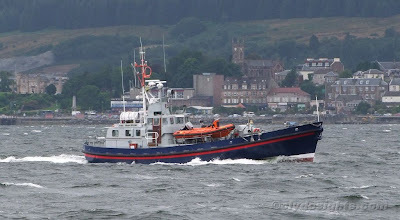 The privately owned former RNLI 70-foot long lifeboat GRACE RITCHIE was seen as she passed Dunoon on her way towards the Holy Loch. Normally based at Largs Marina, GRACE RITCHIE is looking immaculate, and a real credit to her current owner, Iain Crosbie. She was built on the Clyde, the first of a class of three similar vessels that took the river's name as the class title. She dates from 1965. Actually the second of the class. The first in class (70-001) was the Charles H Barrett, now used privately and based in Stellendam, Holland. Annoyingly, in even better condition than "Gracie"!